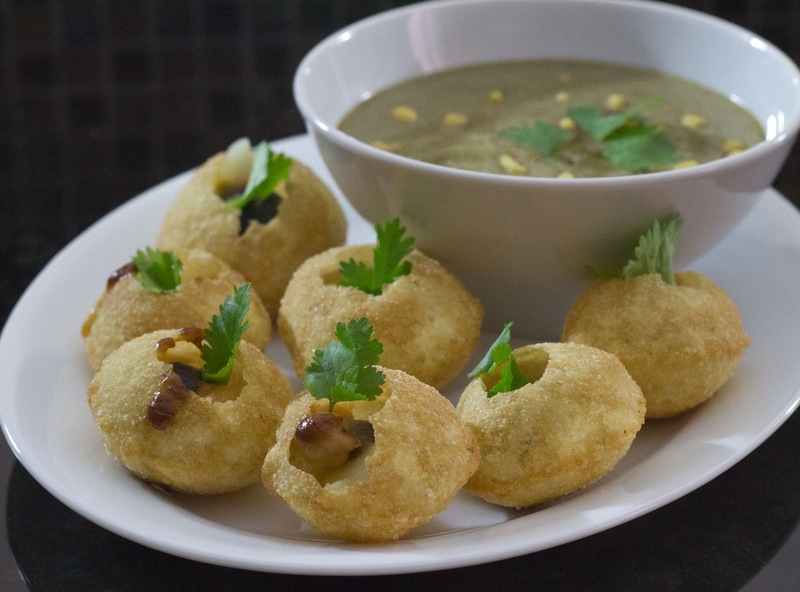 Gol Gappe or paani poori is a mouth watering appetizer. It is one of the most popular street food in India. 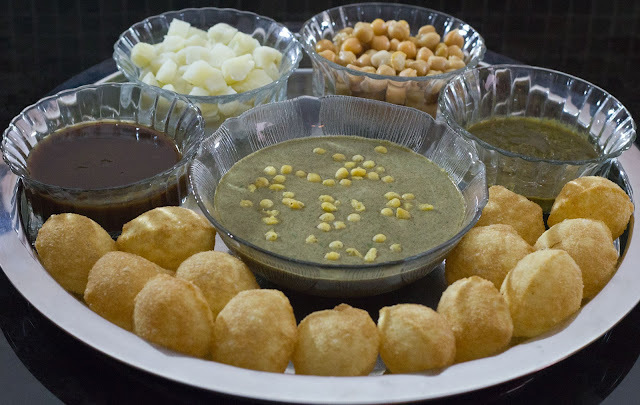 Enjoyed all over the country, this delicious treat is referred to by many names - Gol gappa, pani puri, puchka, paani ke patashe, gup chup, phulki to name just a few. As a kid I remember going shopping with my mom and after a few hours indulging in this yumm treat. Even in college me and my buds would sneak out the back gate and go to 'Bengali Market' for a round of gol gappe. My girls love it too. It is primarily a crisp poori which is filled with potato, chickpeas, green chutney, imli chutney and paani. The catch is that the whole thing has to go inside the mouth all at once for an explosion of varied flavors and textures, or it explodes on you when you bite. So basically you have to collect a bunch of ingredients and be ready. Everyone stands around the server who fills the paani poori with water and serves everyone in a sequence. Not much cooking is involved, just assembling. I am sure every one who has had this dish will know how its assembled. For others here goes. Stuff a few pieces of potatoes and chickpeas through this hole. Add tamarind chutney and green chutney as per your taste. Top with fresh coriander leaves. Now dip the puri in the pani (spicy water) OR add some pani to the puri and put the whole puri in your mouth. Serve some water in a cup on the side for topping it all of. I don't usually make my own but buy these pooris at the grocery store. If you want to make them here is the recipe. Combine all the stuff and knead it with water into a stiff dough. Roll out a thin big round roti and using a cookie cutter cut several 1inch rounds. Deep fry these on medium high and keep aside to cool. They will crisp as they cool. Grind all above together with 1/2 cup water into a smooth paste. Add 5 cups water and taste for saltiness and sourness and sweetness. Adjust as per your taste. I usually serve it as is. Optionally strain the mixture to get clear spicy water. Garnish with boondi just before serving. 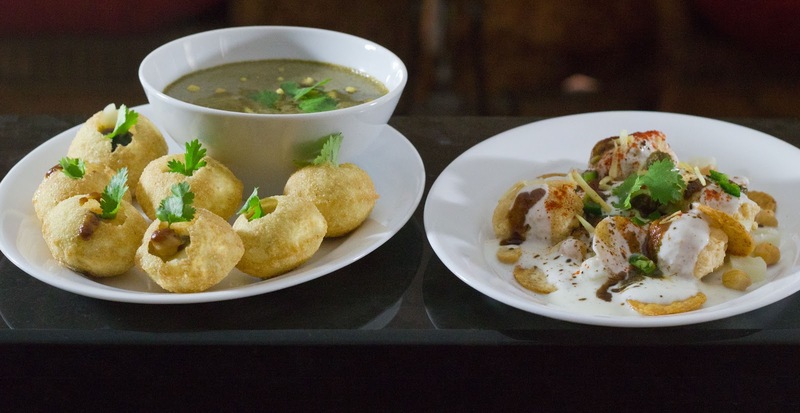 Serve gol gappe with papri chaat for a delectable snack. Stay tuned for the chaat recipe next week. Soak imli in 5 cups of water for minimum 2 hours to soften it. Mash the imli with your hand to extract its pulp. Strain and put it in a saucepan. Bring imli pulp to boil and add all the other ingredients. 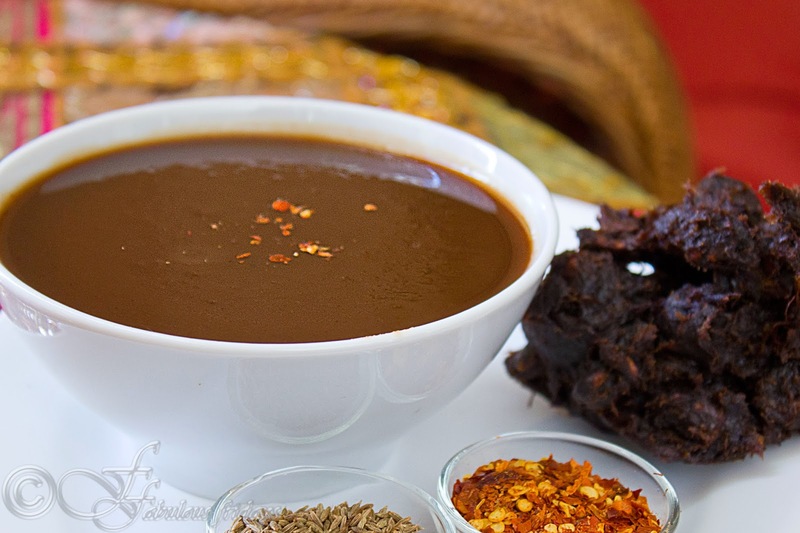 Continue to cook on medium heat till jaggery dissolves completely and chutney thickens and becomes glossy. Keep in mind that it thickens more on cooling so cook only to the level that will cool to the desired consistency. Cool and store in a glass jar in the refrigerator. Keeps for a month. Besan ke Gattey or gram flour dumplings in yogurt sauce is a very popular dish from Rajasthan, India. 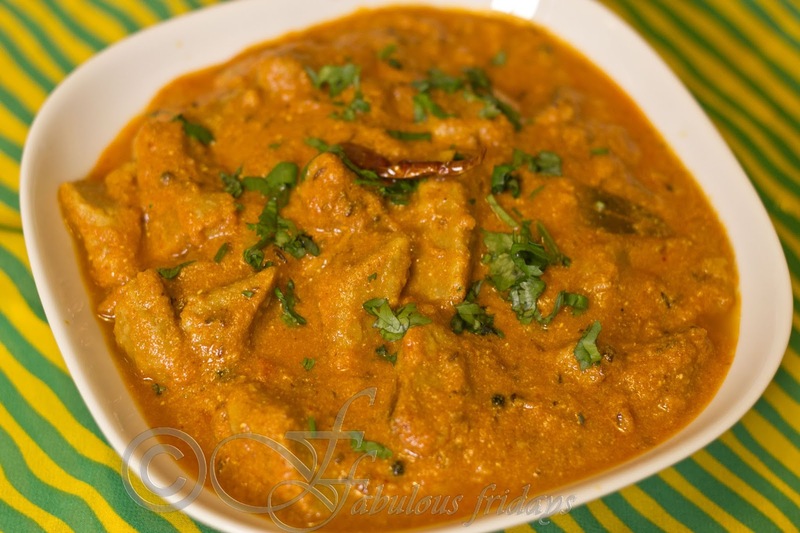 This rich and spicy curry is perfect for the dry and hot climate of the area. The heat level is up to you but rajasthanis spice up their food quite a bit. Eat this with banana pepper rings and roti. I learned this recipe from my mother-in-law who spent her childhood in Bikaner, Rajasthan. 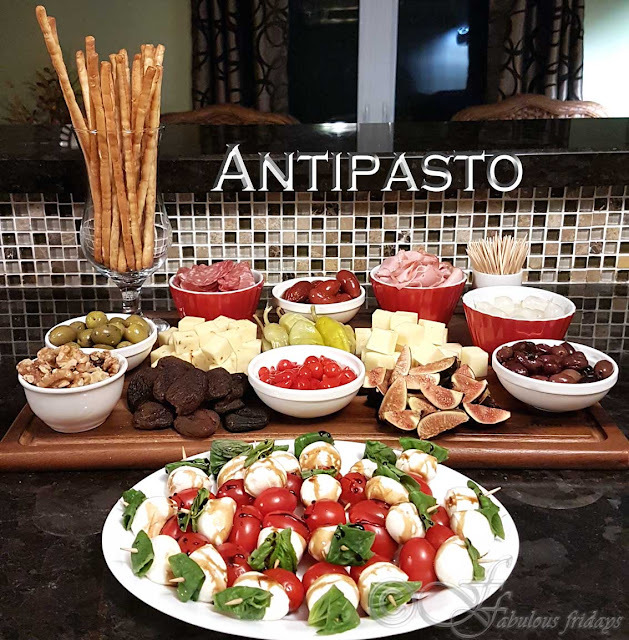 This dish has undergone some transformation over the years. Traditionally very few people in Rajasthan ate onion and garlic. The gravy was made using whole spices with tomato, yogurt and a tbsp of the gram flour to thicken it. Now onion and garlic have found their way into the kitchen and so these are incorporated as well. They help thicken the gravy and add flavor. In another pan take a few tbsp of oil and on medium heat lightly fry the gattas for about 2 minutes. This step is completely optional and is my little twist on the recipe. Remove from pan and keep aside. In the same pan take 2-3 tbsp oil and roast all the dry whole spices for 20 seconds. Add onion and ginger garlic paste and fry till golden brown. Stir frequently to avoid burning. Add tomato and fry till it leaves oil along the sides of the pan. Now add yogurt and do the same. Add the reserved water into the gravy and bring to boil. Gently add the fried/or not gatte into the boiling gravy. 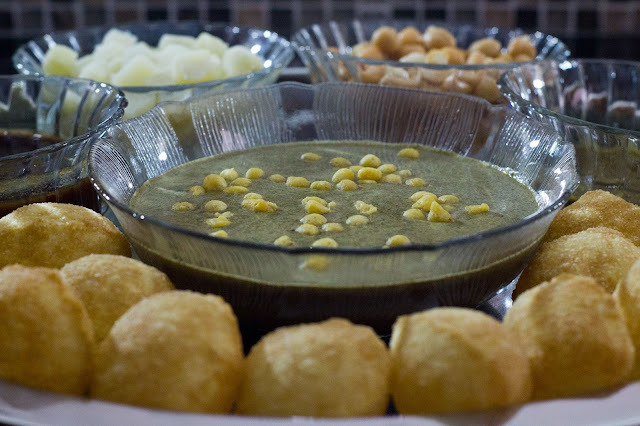 Bring back to boil and simmer for 10-12 minutes to incorporate the gravy flavor into the gatte. Boil off excess liquid to reach the desired consistency. Serve hot garnished with fresh coriander. 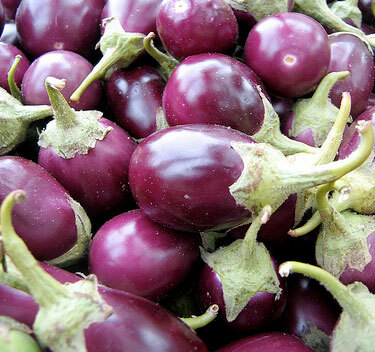 Eggplants have a meaty texture and hold up very well to stuffing and frying process. This is one of my favorite ways to cook baigan. 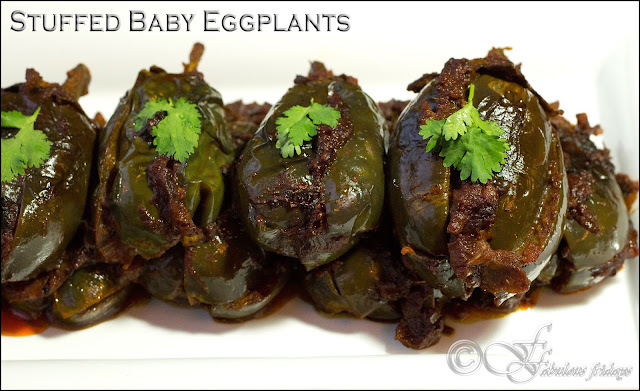 Small Indian eggplants are the best for this recipe. Some use the long ones, but I prefer the small baigans as they are not bitter. In India many versions of this recipe can be seen depending on what ingredients go in the stuffing. This version here is the north Indian version. Takes a bit of effort and time but totally worth it. I stuff the eggplants with the dry spice blend and then cook it in an onion, ginger, garlic and tomato based gravy. I make my own dry blend and the recipe link is given below. You can also buy a ready to use tava fry masala. Just before serving I spoon the tomato gravy roughly inside the eggplants and serve the rest on the side. This procedure makes it easy to cook for a crowd when you have 20-25 eggplants. Wash and wipe the eggplants dry. Keep the stem intact and give a crisscross slit to the eggplant taking care not to separate the segments. Sprinkle the insides with salt and stuff generously with the tava fry masala. 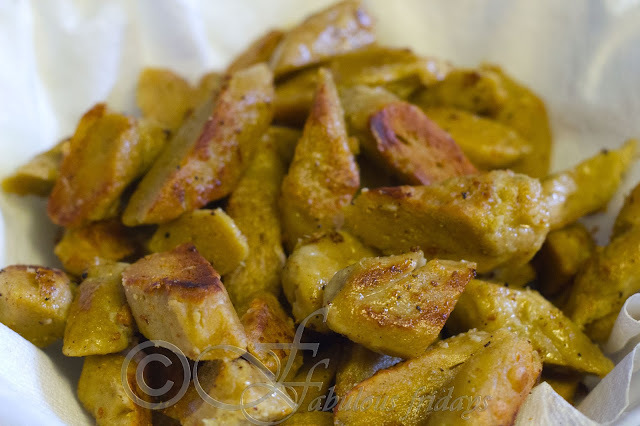 Fry the stuffing while stirring frequently till the mixture leaves oil on the side. In the same pan add about half a cup of water and bring to boil. Simmer and gently lower the stuffed eggplants into it. Cover and cook till done. Turn the eggplants every 5 minutes to ensure even cooking on all sides while spooning the gravy over them as they cook. If the tomato gravy dries up too much sprinkle some water to avoid burning. This process takes about 15-20 minutes on low heat. When the stuffed eggplants are ready, plate them and spoon a little tomato gravy in each. Top the dish with the rest of the gravy. Serve it sprinkled with fresh coriander accompanied by roti or paratha.